Wooden bed post chipped out near center joint on turned portion. Repaired with epoxy putty then glazed and colored to match adding faux grain. Custom turned bed post broken and chipped out with large pieces missing. Repaired by splicing in new wood and carving to match, staining and finishing. Custom wooden crate was broken and chipped apart in numerous areas. Re-glued and touched up all broken areas. The hutch top lower left edge was broken and chipped out badly. Filled broken area and glazed and colored to match. The right upper cabinet door frame was broken and splintered apart with the lattice trim also broken and splintered apart and the glass inserts shattered. Repaired lattice pattern and door frame and replaced the custom glass panels. The top surface was warped and split and had obvious water stains. Repaired by making a new top, staining and finishing to match. 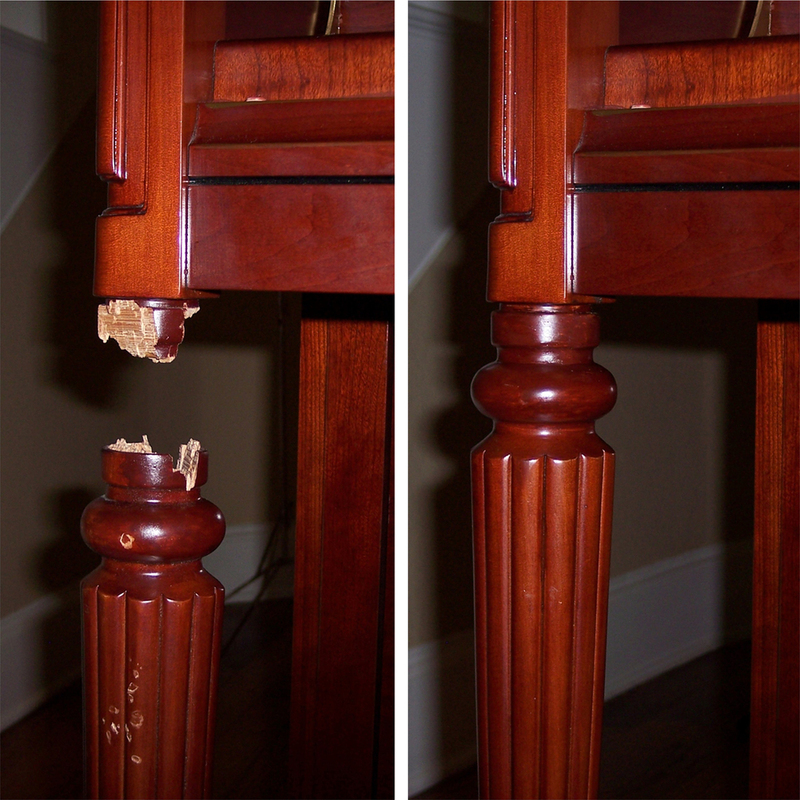 Both front decorative legs had been dog chewed. Repaired by filling the damaged areas and glazing and toning to match. Left front leg was broken and splintered off near the top. Repaired by gluing an oak dowel at the broken joint and touched up area to match existing finish. Mahogany carved table leg was missing a decorative carved section near the top. Repaired by splicing a new piece of wood to the leg and hand-carving to match, stained and finished. 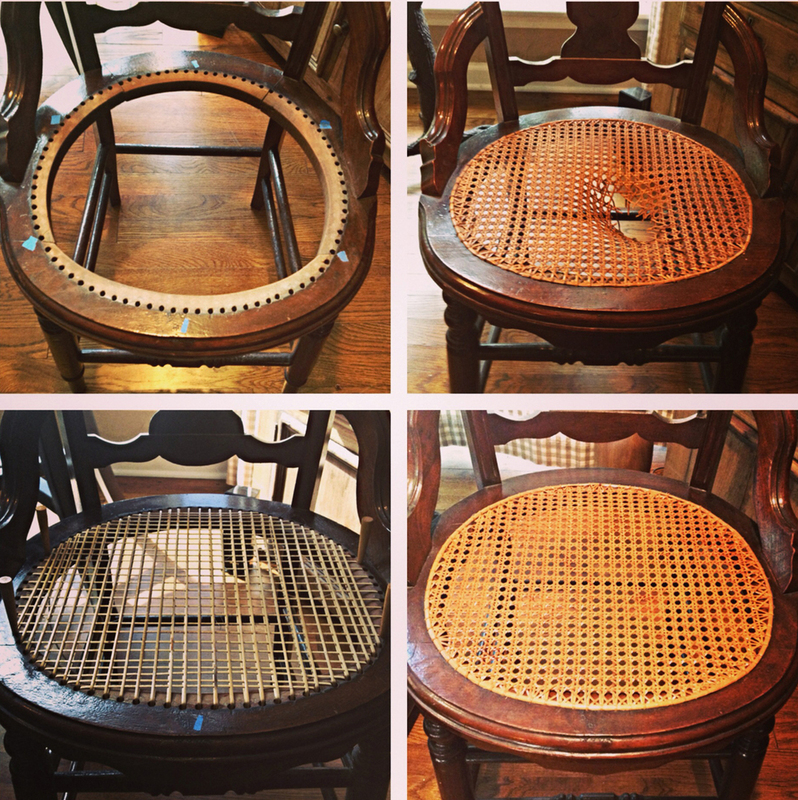 Antique cane seat had large hole broken in the caning. Hand wove new caning, stained and finished to match.